One of the fascinating things about gaining a glimpse of the Truth of Life is that you begin to see wisdom everywhere... Words that you've read hundreds of times before suddenly take on new meaning. Scenes that you've seen thousands of times before suddenly offer something new to see. And thoughts that you've had a million times before suddenly appear with new understanding. You find yourself living in the exact same physical world that you were in before, but the experience of it becomes something completely different. You then get to fall back into an awareness of life that you had when you were very new to this world, without all the heaviness of beliefs and limitations collected from a lifetime of thinking. You get to notice and feel once again, the wonder of life, the mystery of life, the abundance of life, with no clear sense of where you end and the rest of the world begins. 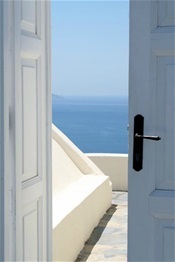 You suddenly open a door in your mind that reveals an infinite number of other doors yet to be explored. What new wonders will greet you in this new year and new life, as the endless appearance of each new NOW reveals itself? One of the paradoxes in life is that "trying" to feel better, in the long run, actually makes us feel worse... It's not so much what we choose to do in life, but the underlying (sometimes not so obvious to us) reasons for doing it. If we do self-help or self-care mostly to quell all the negative judgments we have about ourselves, or to sate our never-ending list of shoulds, then the negative judgments and shoulds will never end. Instead, there's something beautifully profound in discovering 1) the illusory nature of our negative thinking, and 2) the realization of where our judgments and shoulds come from. In the moments when we happen to be in touch with the calmer/peaceful/connected part of ourselves (our true nature), our actions come without much thought and are naturally more self-caring. In the moments when we are disconnected, and giving significance to our thinking, our actions and thoughts become focused on how to fix or change or improve whatever we think is not enough or broken in some way. And the fixing never ends... We think that "life will be better once this is fixed", not realizing that if/when it gets fixed, more things keep getting added to the list. Instead of continually exploring all the self-care measures and gadgets and programs designed to "fix" us, some gentle self-reflection may be the better direction to look in first. Discovering and living from the space of deeply KNOWING that we don't need fixing, is paradoxically what allows us to give ourselves the best self-care.